I’ve always found history very intriguing. Imagining and useeing relics of the past gives me a different perspective of the present. It may not interest a lot of other people but seeing the world in its past form is the closest thing to time travel we’ll ever get. Ancient Rome is the oldest city that present day man has the most documented evidence of. So much in fact that historians can put together detailed dioramas and models in museums. Today, the whole Roman experience gets better. Google Earth has just unveiled a 3D layer of Rome in 320 B.C. The educational benefits of this overlay is staggering for students, especially those who are always bored of history class because it’s so hard to imagine and read all the descriptions of buildings, city layouts and other stuff that made Rome the light of the world in its time. 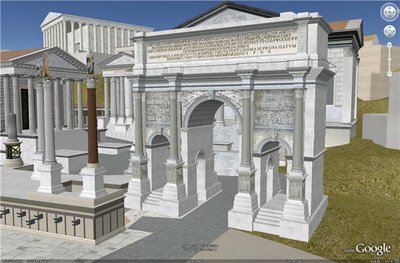 Now with the 3D rendering of the entire city of Ancient Rome, students will have the chance to walk down the aisles of the city and see the sights. As Ancient Rome only being an Overlay in Google Earth, this does not interfere with modern Rome which can still be viewed by desselecting the overlay.